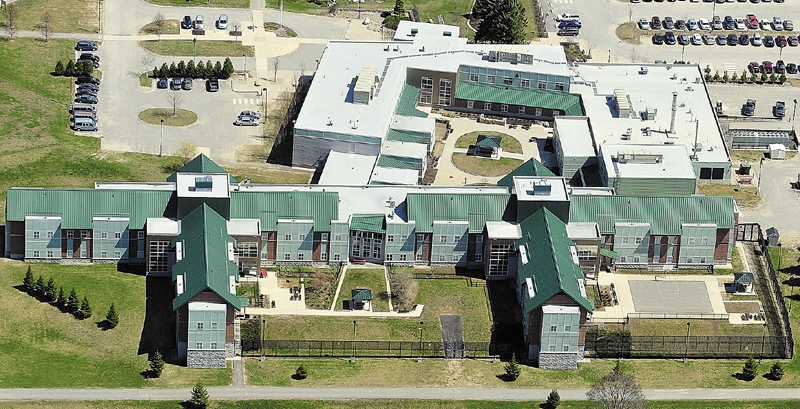 Federal regulators were horrified that corrections officers had been subduing patients at the Riverview Psychiatric Center with stun guns and handcuffs, according to newly released inspection details. AUGUSTA — Federal regulators were horrified that corrections officers had been subduing patients at the Riverview Psychiatric Center with stun guns and handcuffs, according to newly released inspection details that threaten to spike $20 million in federal funding for the state mental hospital. The inspection said the county corrections officers used Tasers and handcuffs. Those Tasers were gone as of May 24, and the contract for Kennebec County to provide corrections officers to the hospital ended Sunday. The corrections officers from the Kennebec County Sheriff’s Office were brought in as a safety measure following attacks by patients on their peers and on hospital workers. Initially, county officers augmented state corrections officers, and now the responsibility for safety at Riverview has been resumed by state corrections personnel. Security had been stepped up following a particularly vicious attack on a mental health worker March 16 by a patient, Mark P. Murphy. But those security measures were cited top among deficiencies by state and federal regulators who inspected the state forensic hospital in unannounced visits May 810. And if those problems at the 92-bed Riverview Psychiatric Center remain uncorrected, the federal Centers for Medicare & Medicaid Services has warned the hospital it could lose $20 million in federal money — more than half its operating budget — beginning Sept. 2. Riverview Superintendent Mary Louise McEwen said today that a plan to correct the deficiencies was submitted to federal officials on Friday, and she hopes it will be accepted. She said corrective measures began almost immediately after the visit and the report, which was sent to the hospital June 4, but there was some initial miscommunication about what federal officials wanted to see in a corrective plan. “We understand completely what we need to do to satisfy their requirements,” McEwen said. Gov. Paul LePage blames the Democrat-controlled Legislature for failing to fund his proposal to alleviate problems at Riverview by creating a mental health ward at the Maine State Prison in Warren. He is asking lawmakers to return to work on the issue before the next session in January. Failure to prevent abuse, putting patients in immediate jeopardy. “The hospital permitted law enforcement personnel to use Tasers and handcuffs on any patient on the unit, and allowed them to intervene for any patient who they perceived as demonstrating threatening behavior,” the report stated. The hospital addressed that issue during the site visit in May, initiating education for staff and Kennebec County Sheriff’s Office corrections officers, protocol clarification and hospital review of all incidents, according to the report. One county corrections officer, interviewed by the survey team, reported threats from patients were always present in the Lower Saco Unit of the hospital, and that Tasers carried by officers act as deterrents. “He stated that one patient who had destroyed a lot of property had stated in a joking manner that he/she would not do that any more because he/she didn’t want to get ‘Tasered,'” according to the report. McEwen said that concern was being addressed by having the state corrections officers work solely on the Lower Saco special unit, a six-bed area, and following the direction of the medical treatment team. The corrections officers all go through the Maine Criminal Justice Academy and have training in Non Abusive Psychological and Physical Intervention, “and they do carry pepper spray and handcuffs,” she said. Failure to comply with laws that ensure patients are treated in a safe setting and free from physical and psychological abuse and harassment. One protocol provided to the survey team indicated that “if at any time the (Kennebec County Sheriff’s Office) deploys the Taser, staff do not remove the probes from the client.” Once Taser probes are removed by sheriff’s officers, Riverview staff will assist the sheriff’s officers to move or secure the client as needed, the report states. While hospital personnel are trained in Non Abusive Psychological and Physical Intervention, known as NAPPI, the county corrections officers were trained in use of restraint and control, the report says. The report also faults Riverview with failing to meet standards for patient rights involving restraint or seclusion. “Based on observation of forensic units on May 8-10, 2013, review of three inpatient clinical records, document review and interviews with patients and key staff on May 8-10 , 2013, it was determined that the hospital failed to ensure that the least restrictive interventions were utilized for all patients,” according to the report. Other problems include: Failure to conduct annual nursing assessments on three patients identified as Record V, X and Z. Failure to meet the standard for handling of grievance complaints. Several violations of the Life Safety Code, including using two sliding deadbolt locks and a key-operated lock on doors leading to a “seclusion patient suite.” The locks were removed May 8. The hospital itself also had other physical deficiencies, including dead flies on ceiling fixtures in four rooms on the Upper Kennebec Unit. Also on May 8, an inspector asked a deputy monitoring a seclusion room in the Lower Saco Unit, a forensic section, to open the door. “Prior to opening the door, the officer inserted a steel rod into the floor outside the door,” restricting the opening to 10 inches. Other problems cited failure to follow quality report improvement initiatives because of a “significant loss of psychology providers” during the second quarter of 2013. There were failures to document rehabilitation orders in the patients’ records and unrevised treatment plans for patients, some of whom refused treatment, and one of whom claimed to have retired from treatment. Details of the report showed one patient was placed in seclusion almost continuously for several days after repeatedly swallowing objects — forks, pens, plastic objects — at one point perforating her esophagus. The patient was too acutely ill to participate in a treatment plan that called for staff to encourage her to attend several group therapy sessions. 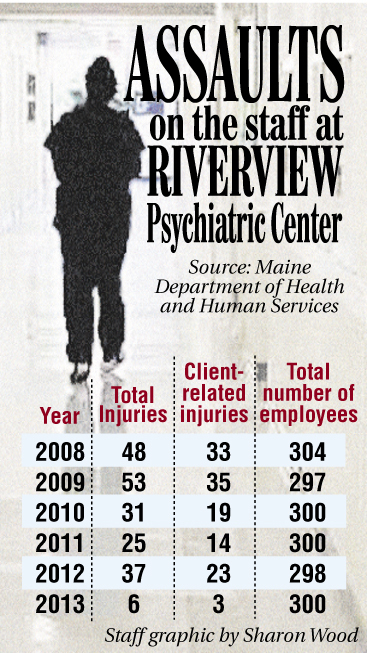 The three-day survey in May by regulators was unannounced, and occurred when 81 people were hospitalized at Riverview. The survey team took a detailed look at practices at the hospital and looked in-depth at schedules and treatments for 10 patients. The medical director was blamed for failing to monitor active treatment plans and take corrective actions. In addition, the director of nursing failed to ensure that “management of violence-prone patients was conducted by clinical staff and without the use of armed sheriff officers” and failed to provide adequate numbers of registered nurses to monitor and supervise patient care on two of four wards, the two serving acutely ill patients. The survey team cited in particular the May 25 staffing schedule showing that only one registered nurse was on duty in one unit during the night shift, and two registered nurses worked during the day and evening shifts. Recruiting nursing staff has been a problem because of the wage scale. “With the state being at no raises and no merit increases over four years, we were not able to be competitive,” McEwen said. However, she said raises due to take effect in September and December should help with recruitment. Several findings related to the hospital’s Portland Outpatient Clinic: Failure of the hospital’s governing body to ensure compliance with a number of federal requirements, including infection control at the Portland Outpatient Clinic where the dentist and dental hygienist said they did not normally wear protective eye wear; and torn covering on an examination table that would make it difficult to be cleaned and sanitized, plus problems with locks and fire ratings on doors. Former Chief Justice Daniel Wathen oversees a long-standing consent decree that settled a lawsuit by mental health advocates that holds the state mental health system to agreed-upon standards of care. Wathen had referenced “two serious security situations on the Lower Saco Unit” in his most recent report issued last month. “One incident involved a client assaulting a member of the staff and the second involved jeopardy to the health and safety of patients arising from the actions of correctional officers providing unit security,” Wathen wrote in a report. He also said the deficiencies could form the basis for a request to reinstate active supervision of the hospital by the court, but he was not seeking that yet. Kennebec County District Attorney Maeghan Maloney’s office prosecutes those charged with crimes at Riverview, and represents the state when some forensic patients seek changes in their conditions. Maloney said she supports the creation of a new mental health facility within the state prison serving those with severe mental illness.